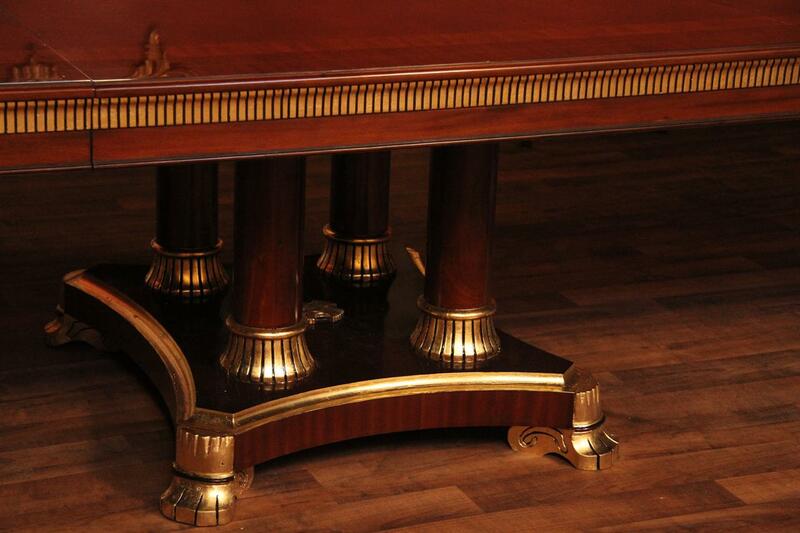 The four columns on the center pedestal make this one of the sturdiest tables. 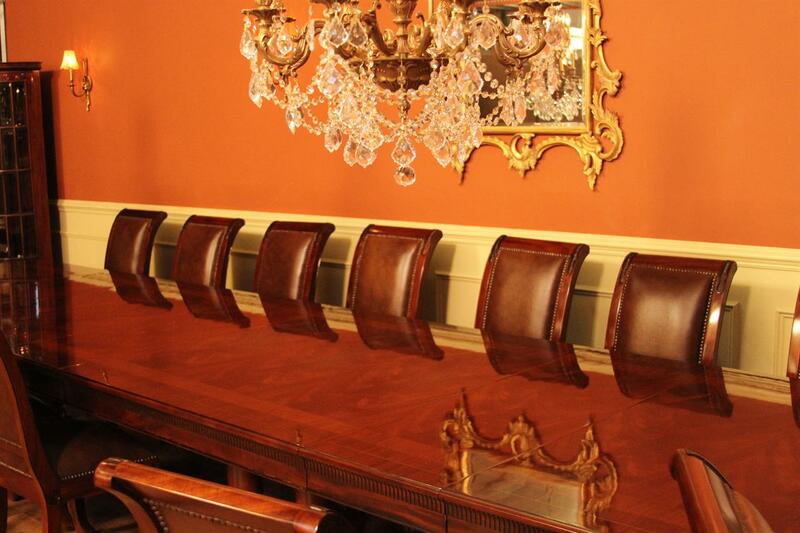 King Demure upholstered arm chair shown at head of table. 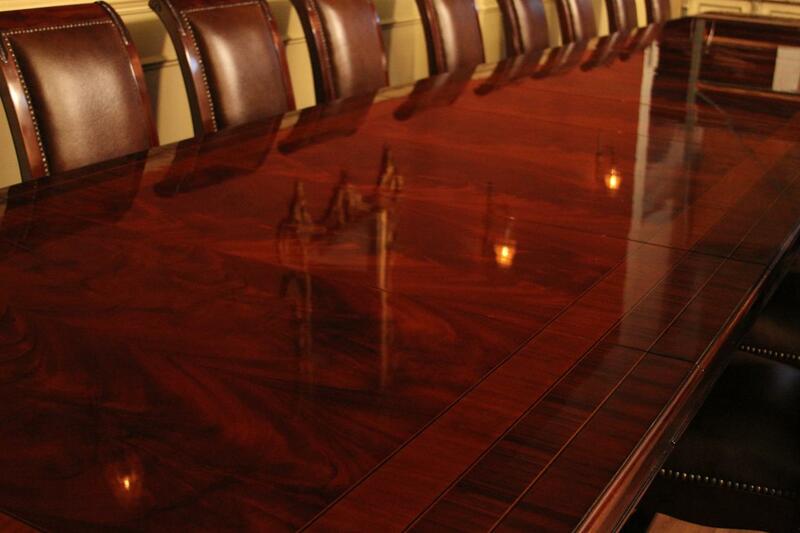 Dark lighting will impact the overall color of the table as shown here. 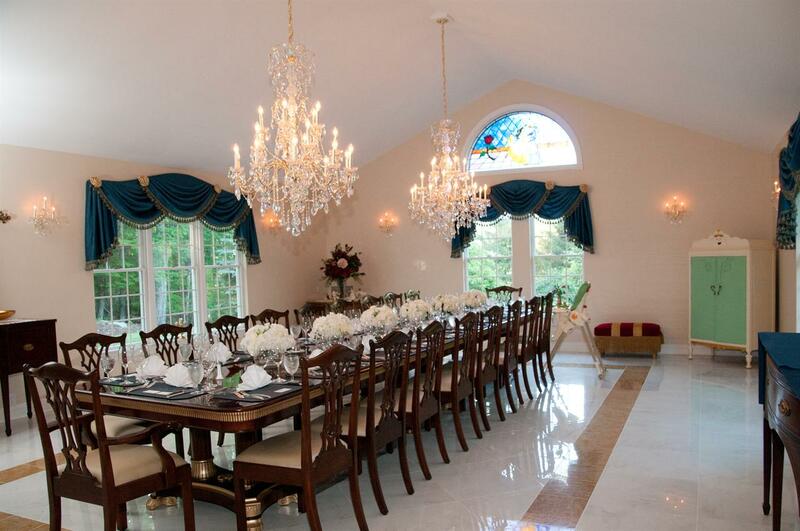 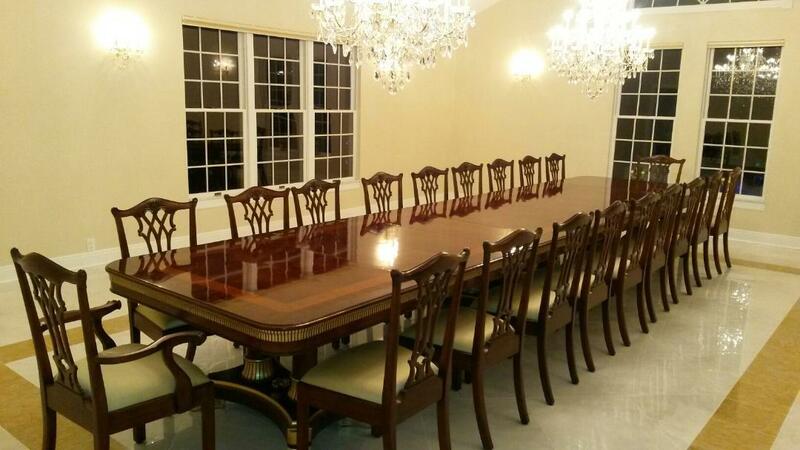 High end dining room table fully extended to 22 feet. 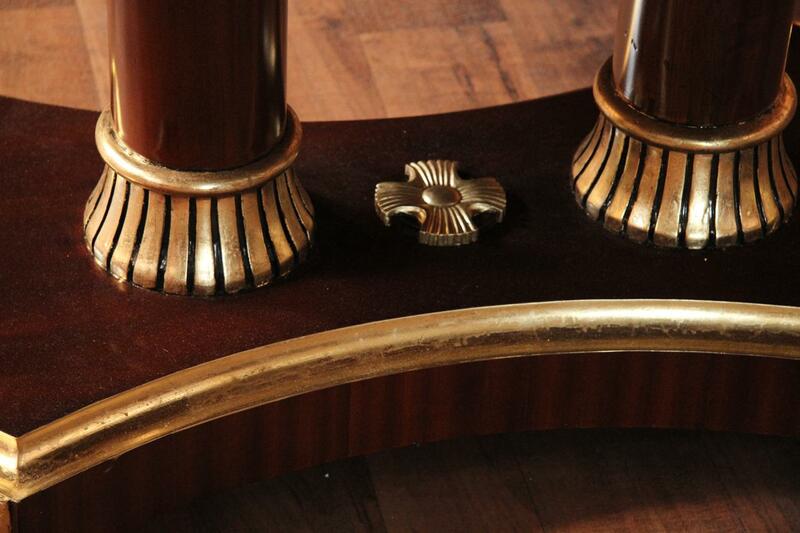 Routered details on foot match the KD uphostered dining chairs. 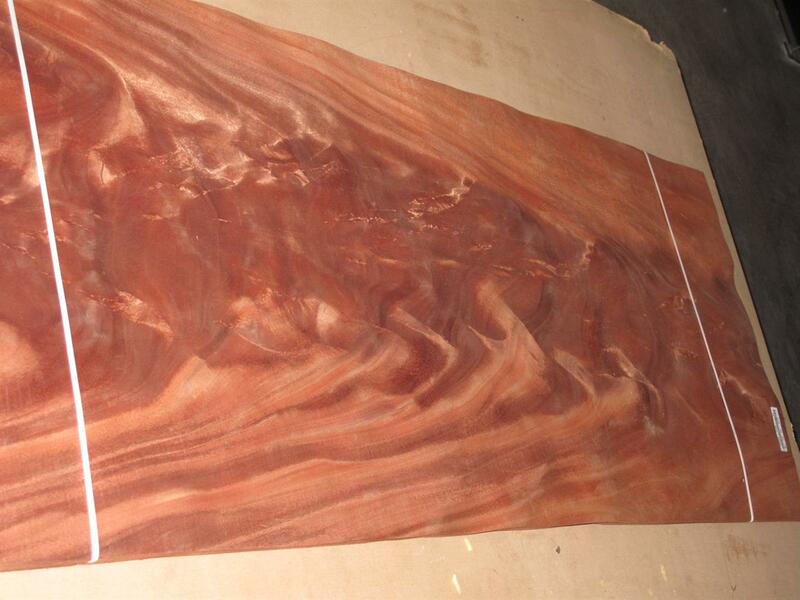 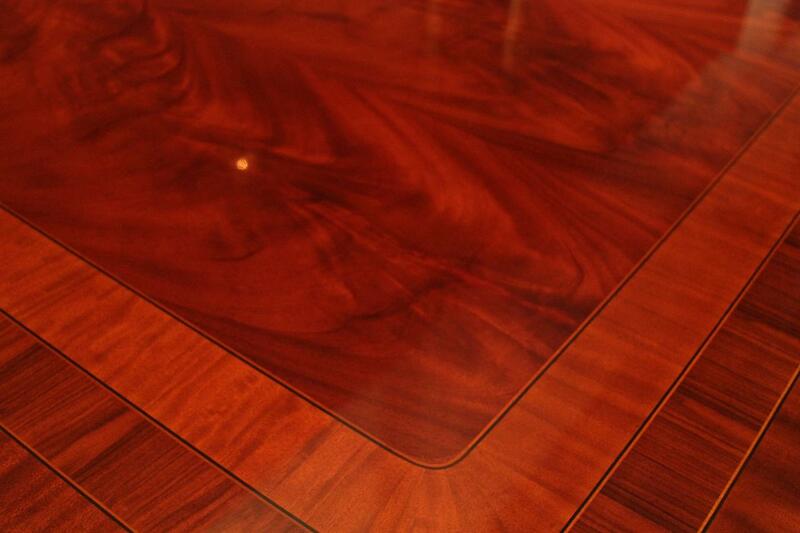 Red mahogany finish will be darker than the brown mahogany finish and shows more red tones. 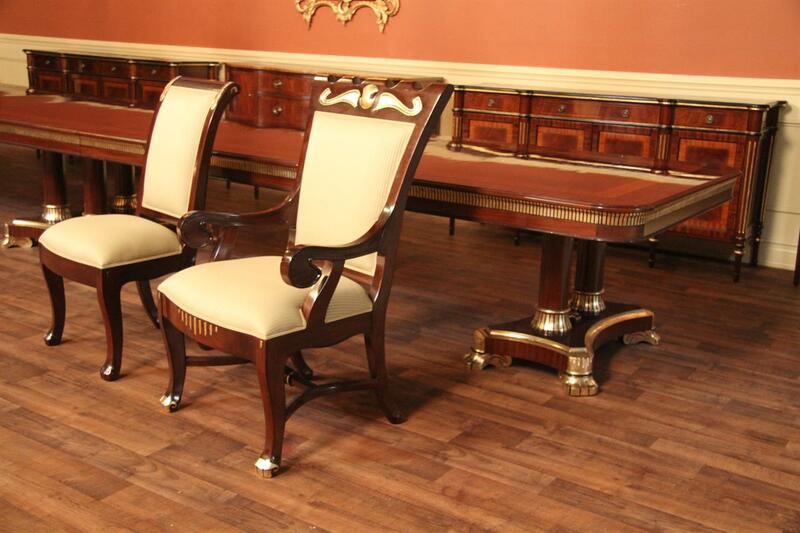 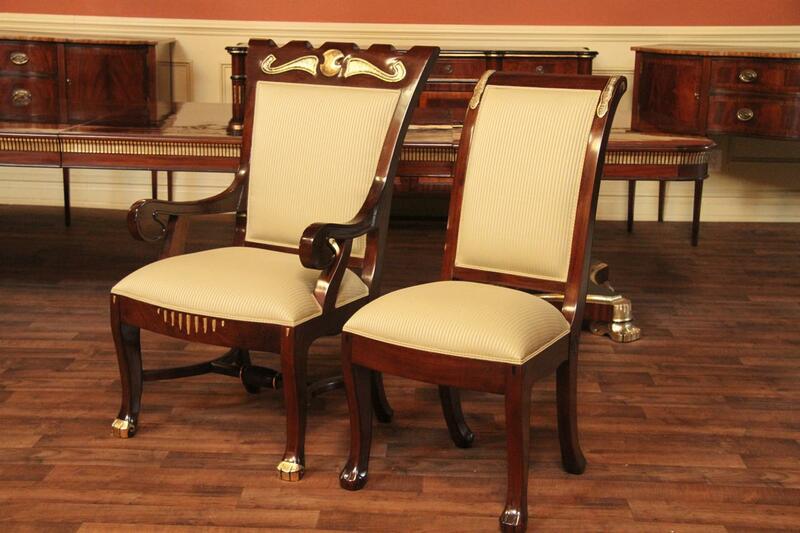 Modern paw foot design for those who like a transitional regency style. 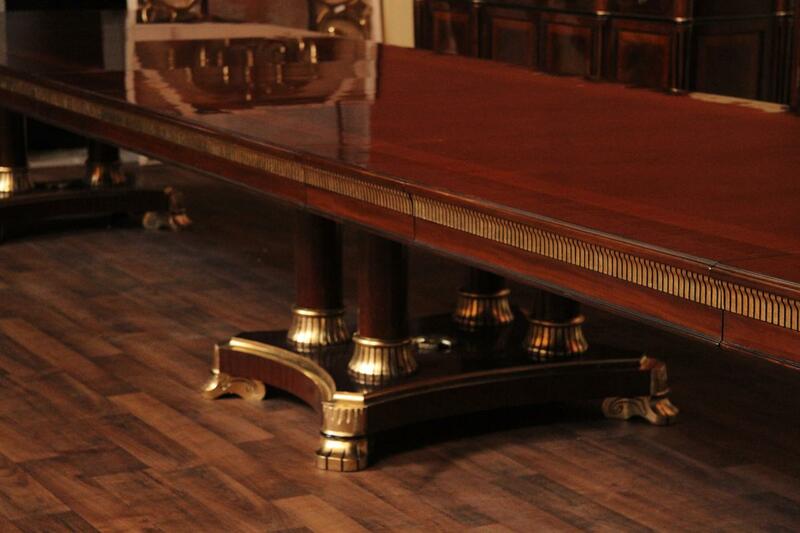 Double columns on this table make it the sturdiest table in its class. 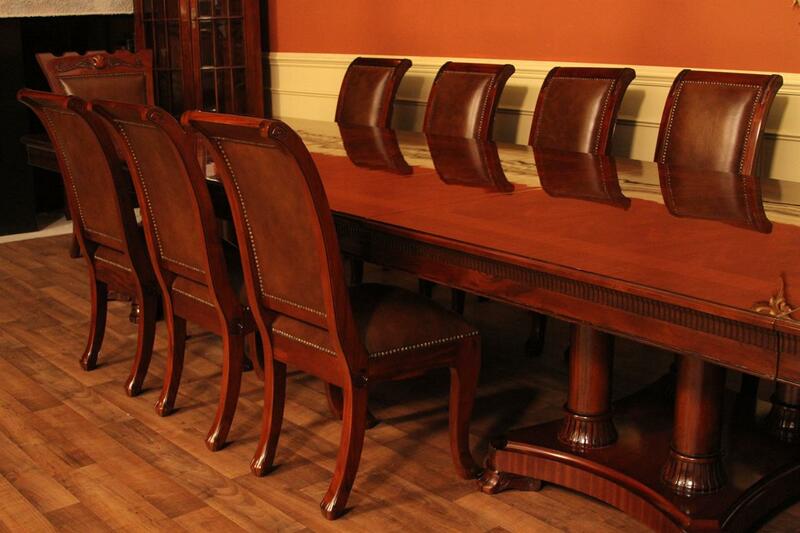 Make a mahogany dining room set with this table by adding the matching KD chairs. 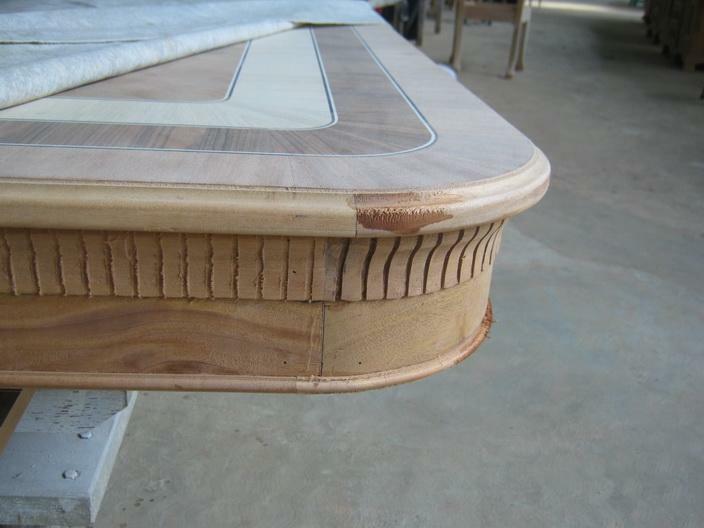 Corner details of table top before Veneers are laid down. 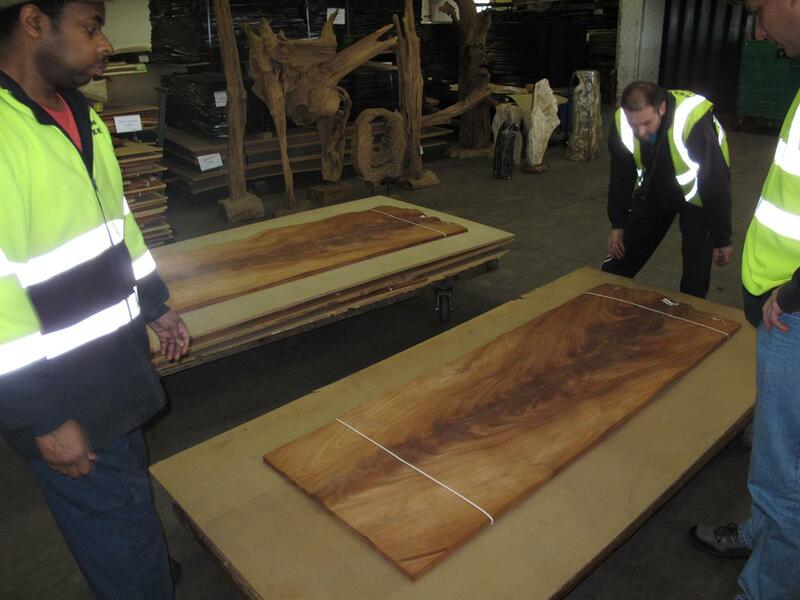 Designer dining tables are built to specs and pictured at the factory for our approval. 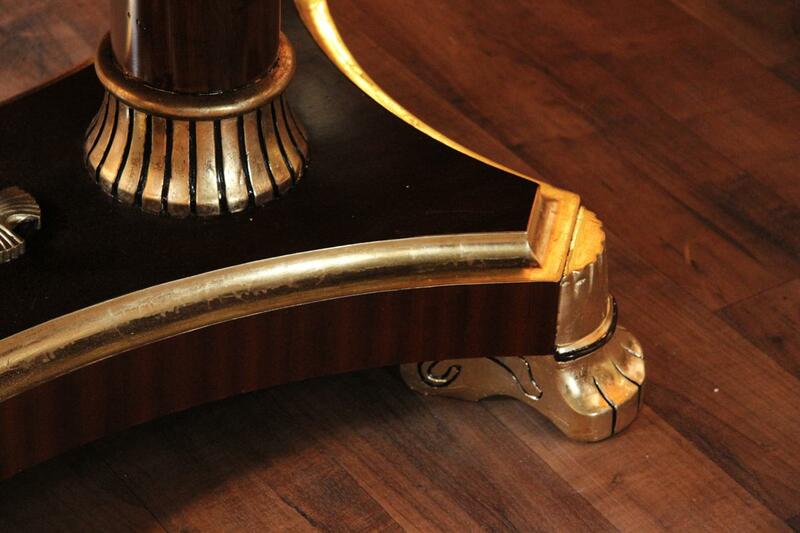 Pedestal collar and custom foot built and pictured for our approval during manufacturing. 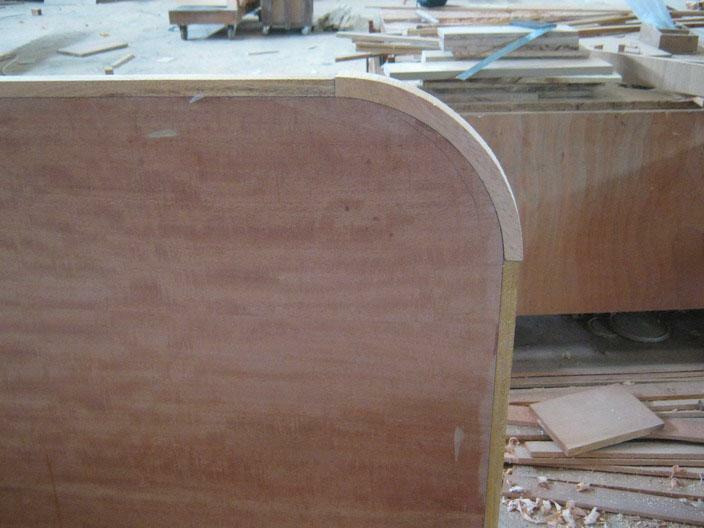 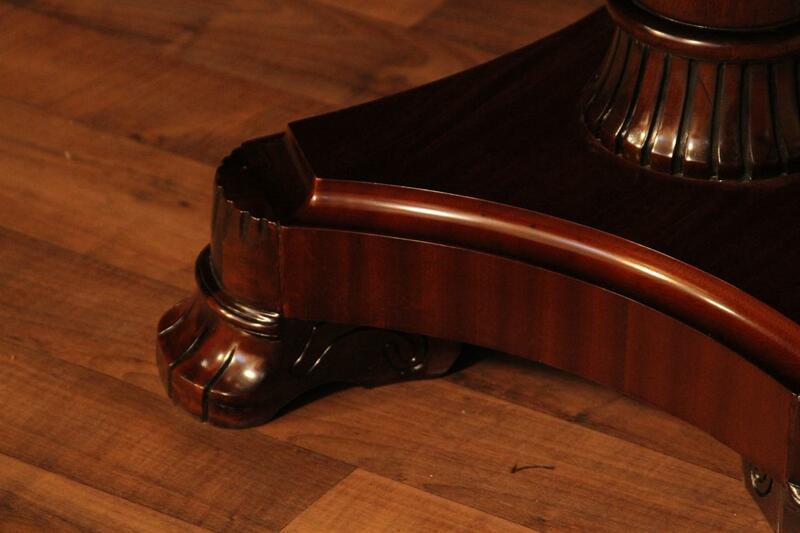 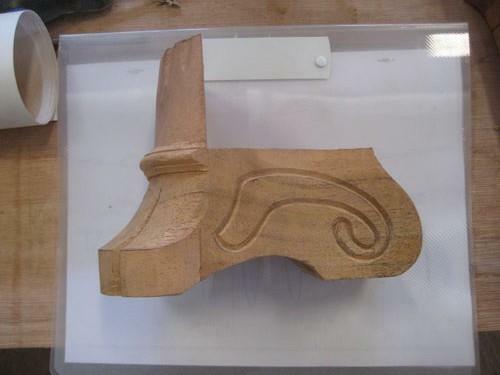 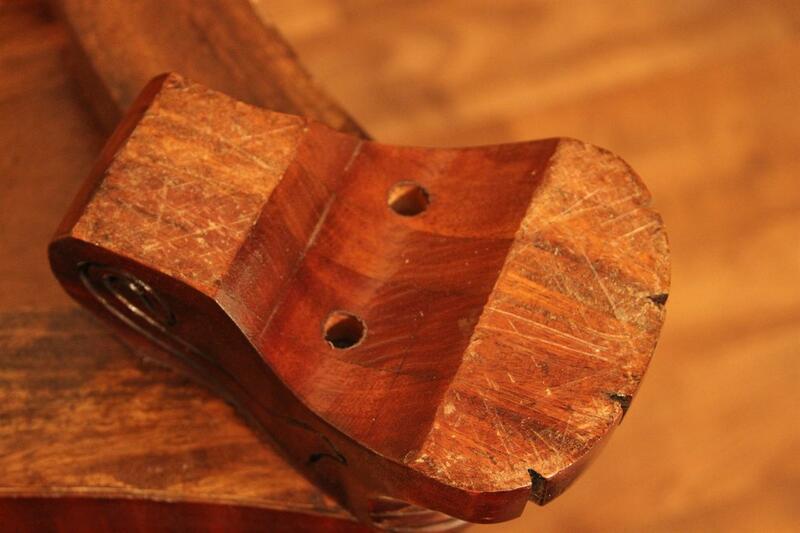 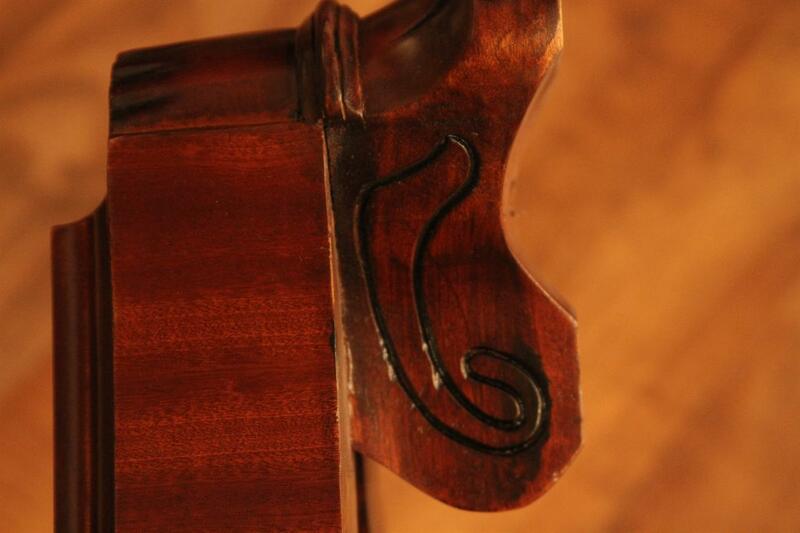 This foot was the final design for the King Demure dining table. 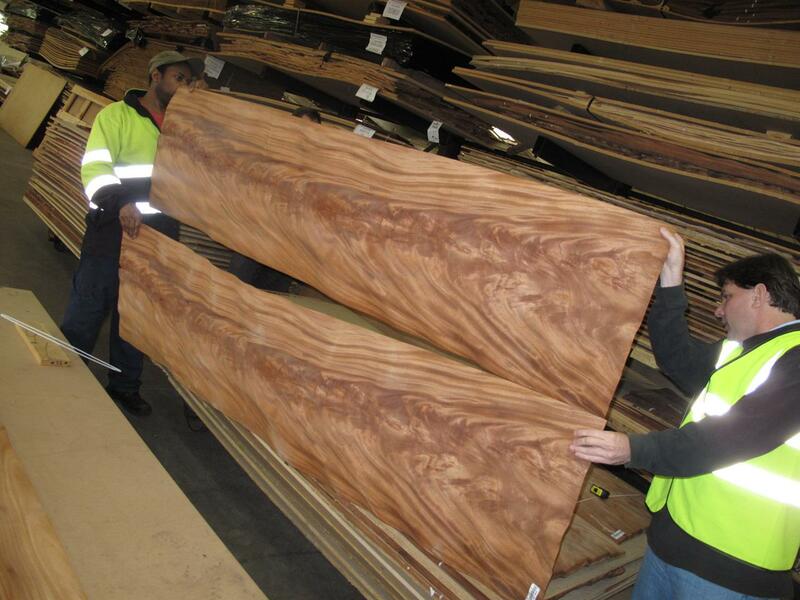 AP handpicks Veneers. 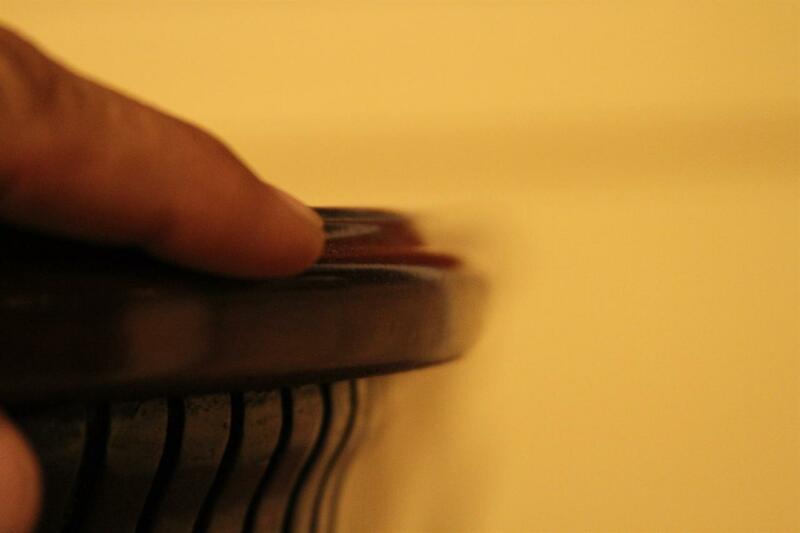 Cracks and unusualy dark tannins should be avoided. 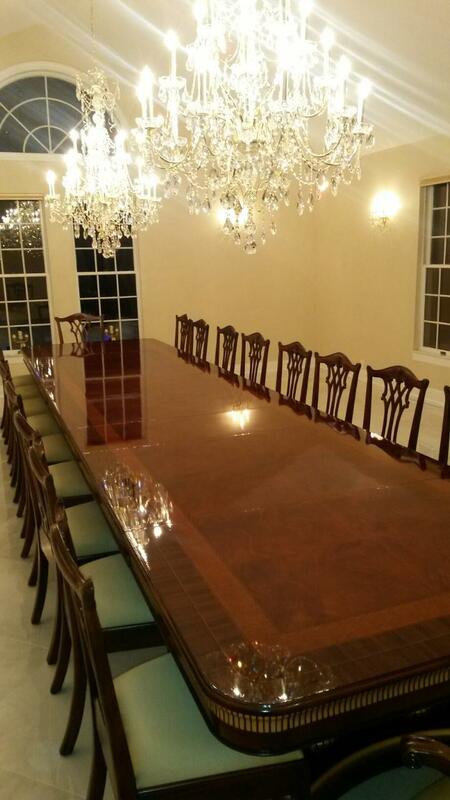 Description: Mahogany dining table designed for an extra large dining room. 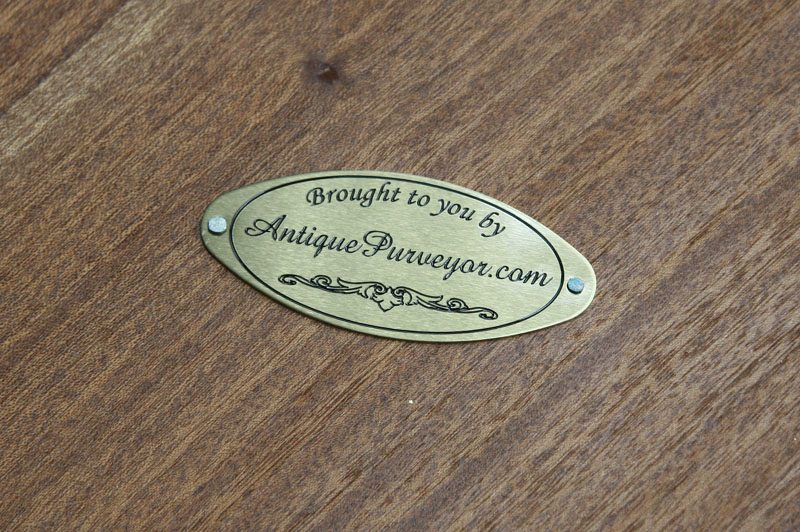 Copyrighted design by AntiquePurveyor.com. 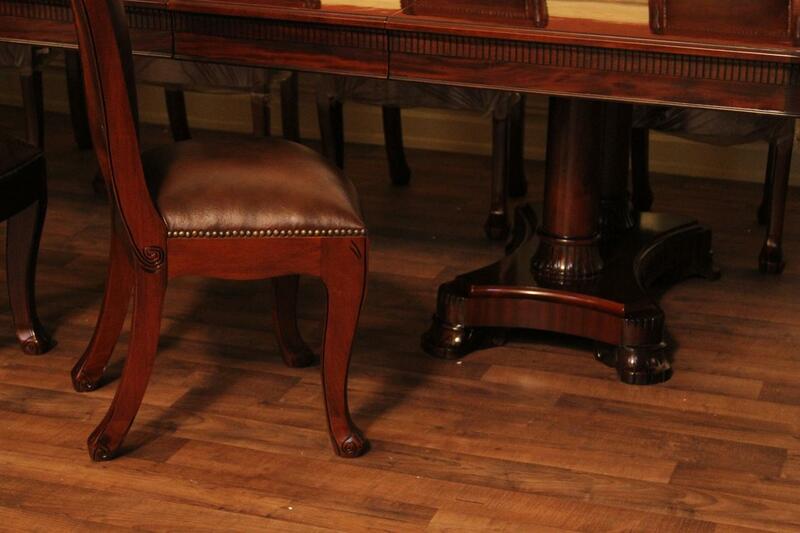 This design is also available in a "lite" version which is much smaller and sells for less money. 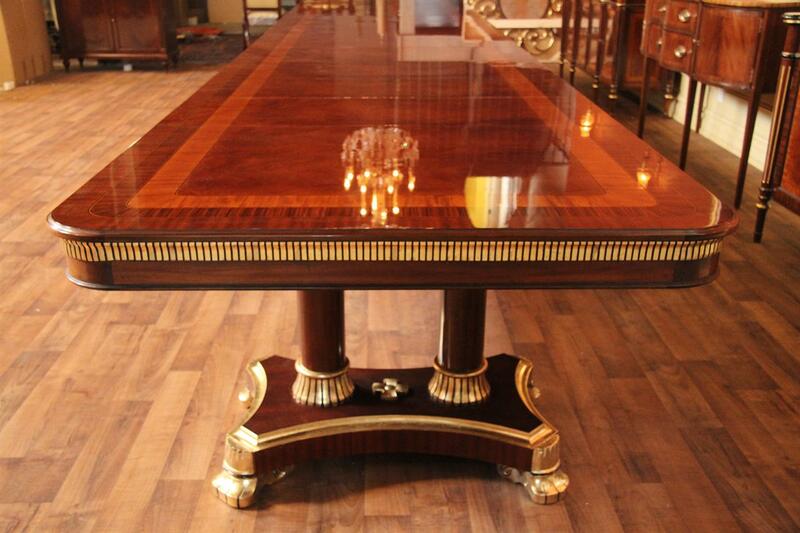 Search 'KD Lite' in the search field to find that table or look on the right margin under related products. 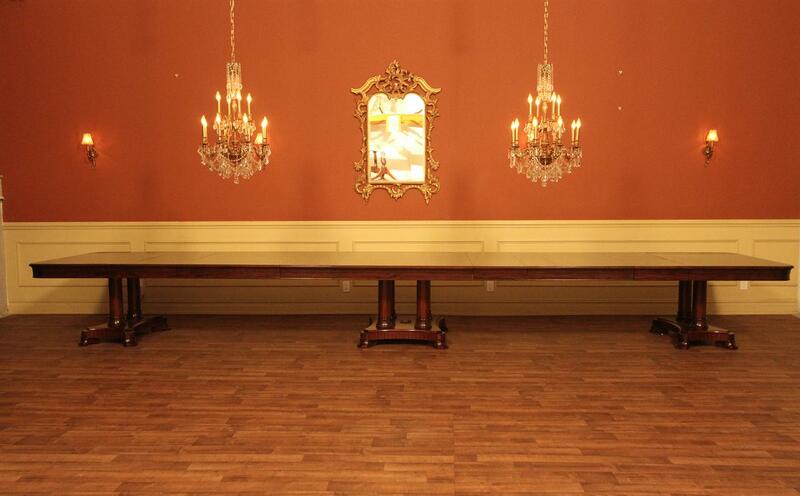 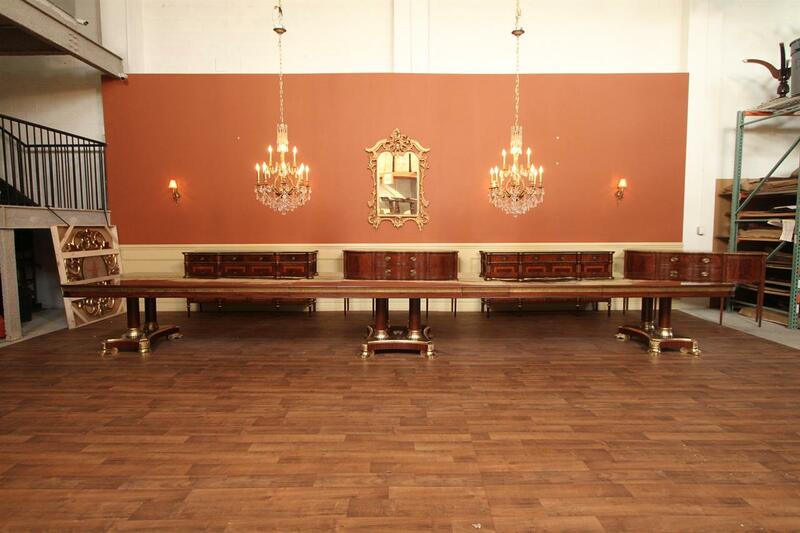 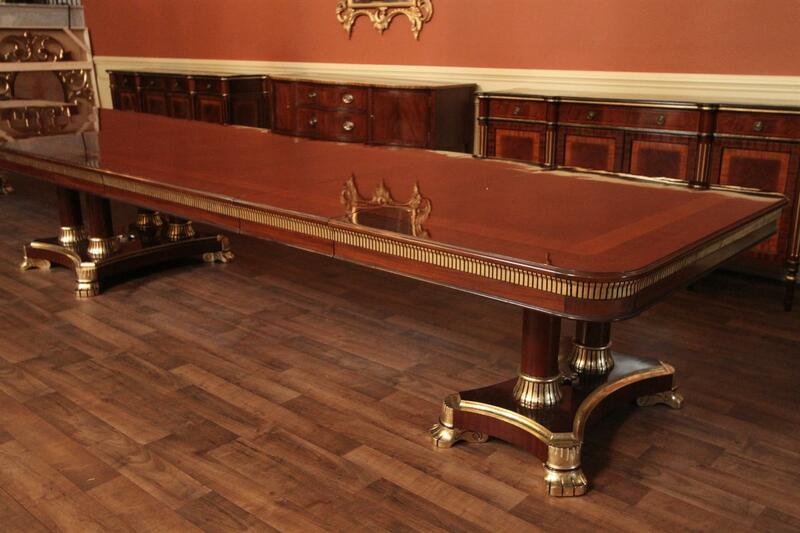 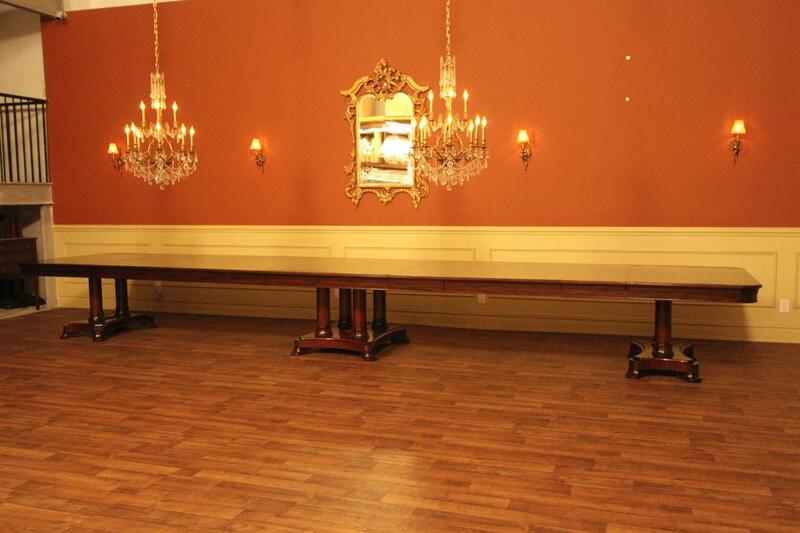 This high end mahogany dining table can be used from 10 feet to 22 feet in 3 foot increments. 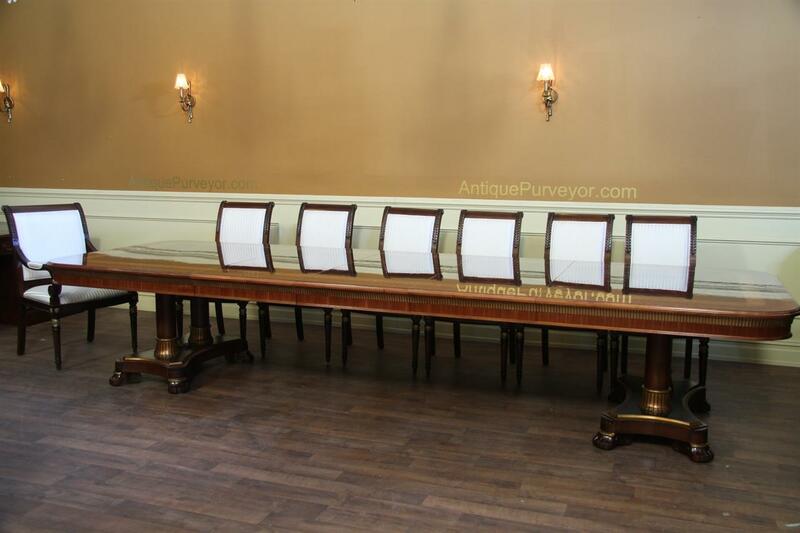 All extra large dining room tables should be designed for sturdiness in any configuration, and this table is very sturdy. 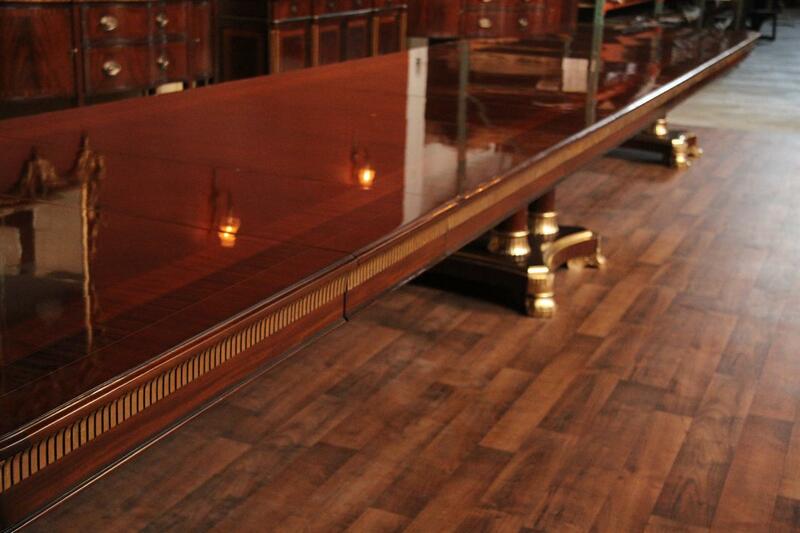 There is no play, shake or twist in this table even in its largest configuration. 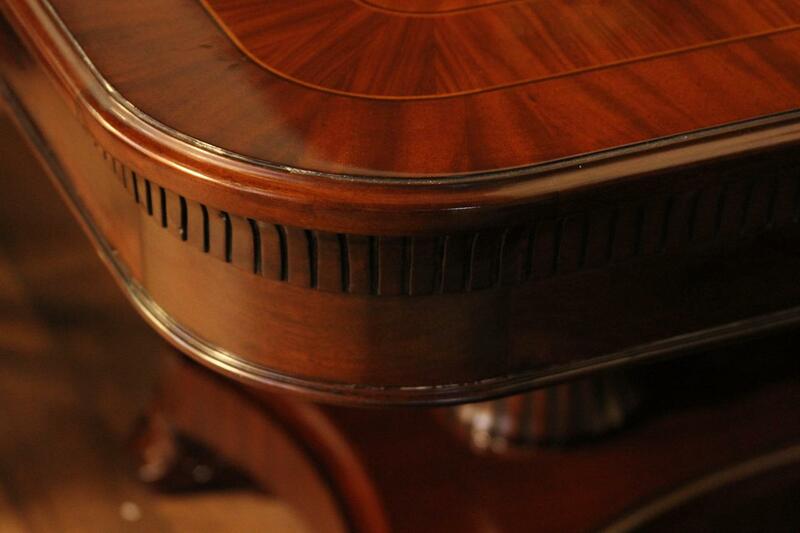 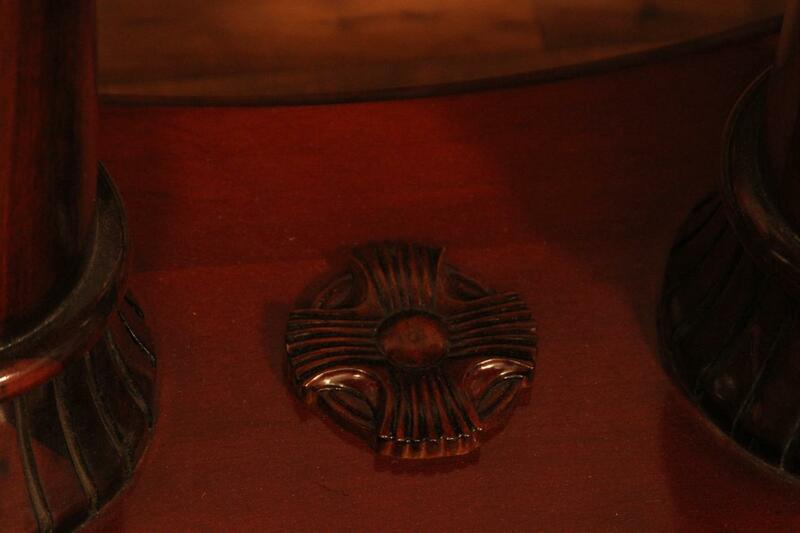 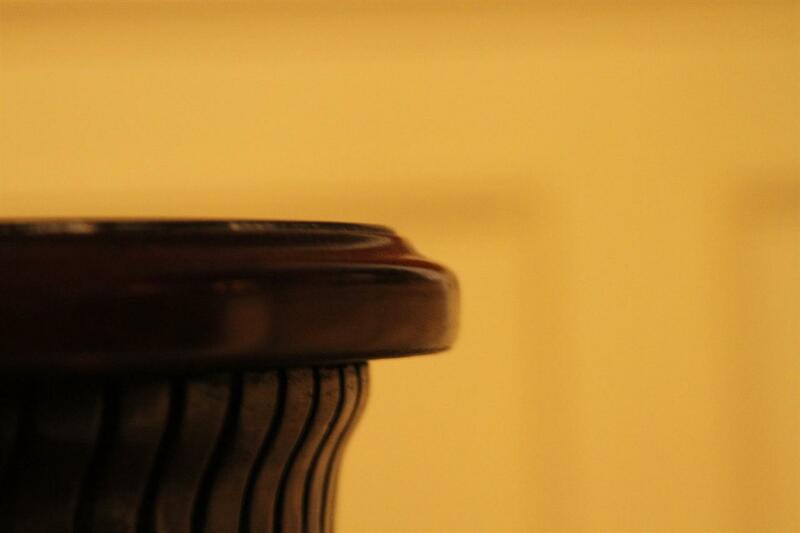 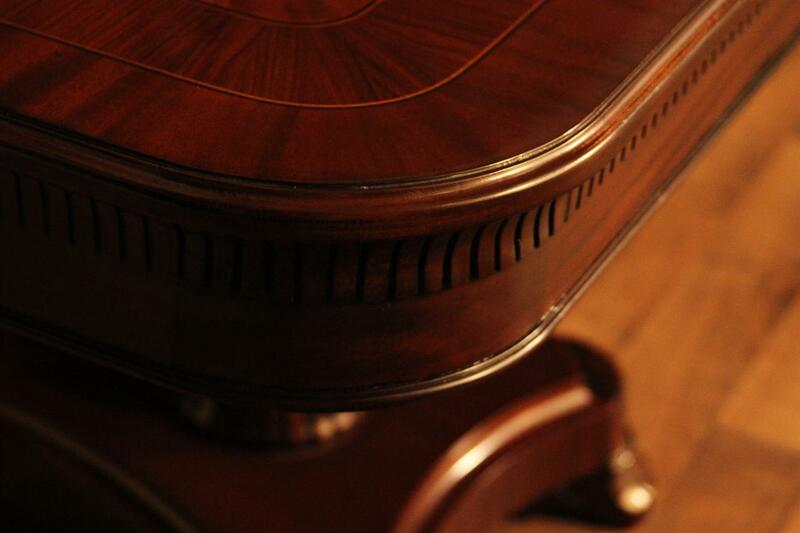 The mahogany pedestal bases have a wide foot print and holds the table rock solid. 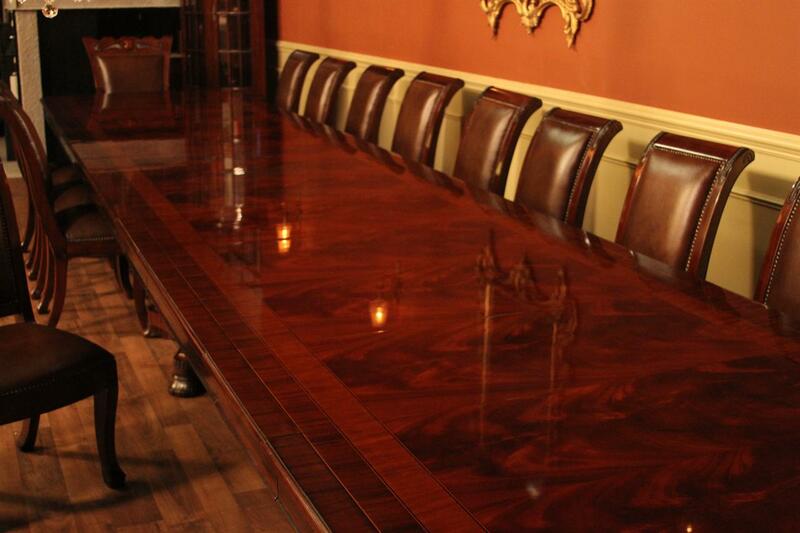 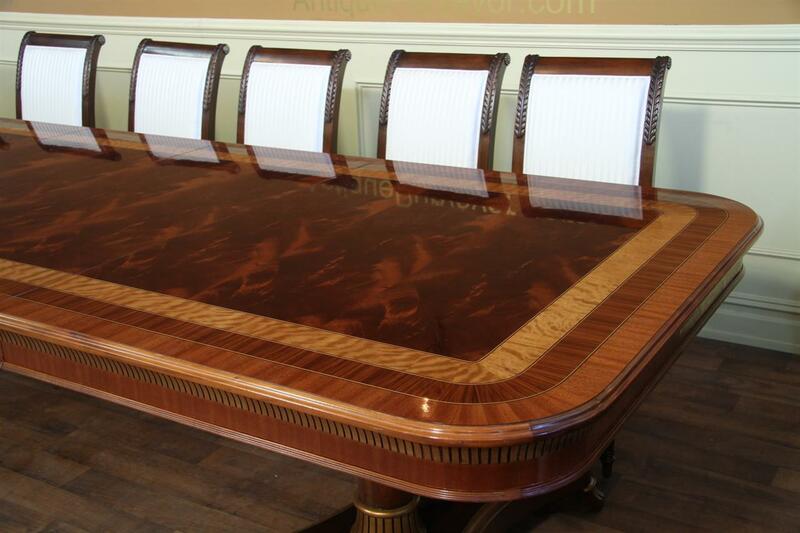 All of our designer dining tables are manufactured with mahogany solids whereever possible. 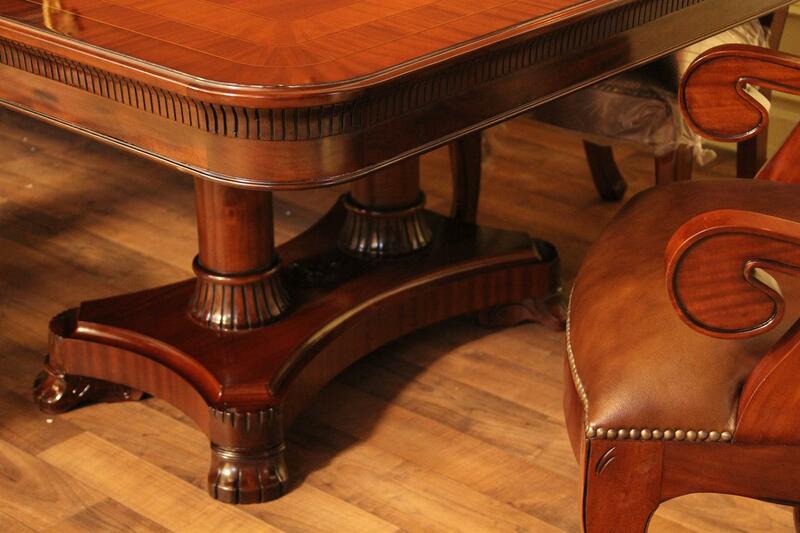 Aside from the table's face, this table is solid mahogany. 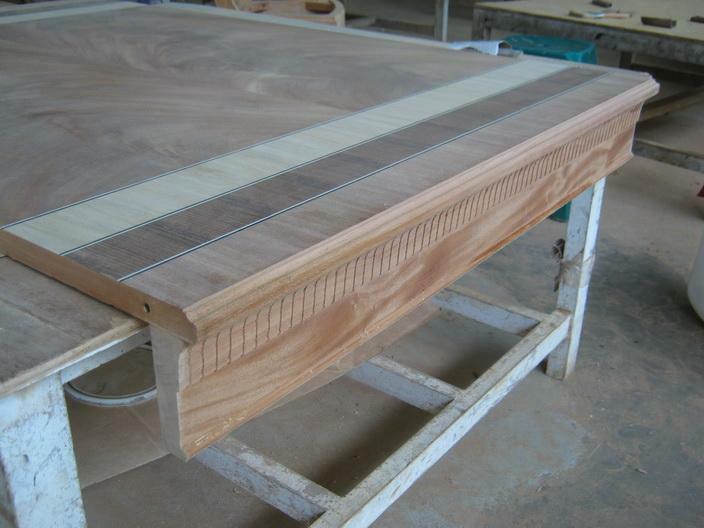 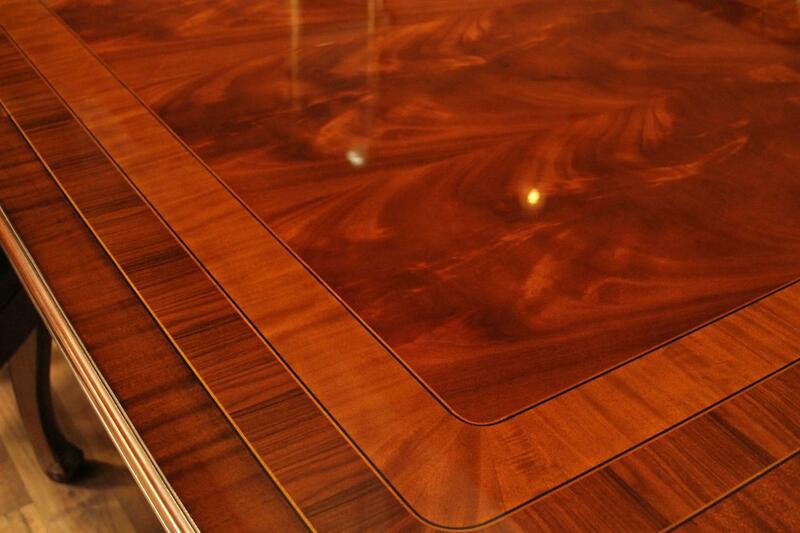 The face of the table is a composite with fancier crotch mahogany Veneers. 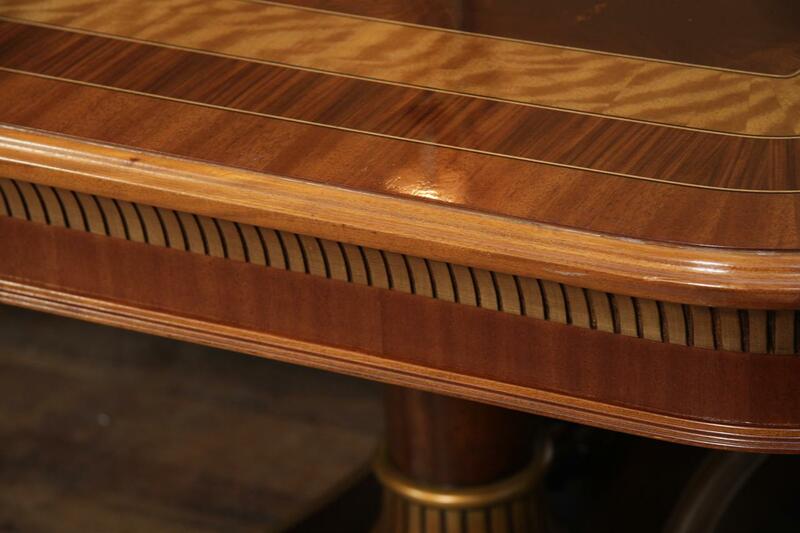 If it was possible to press fancy Veneers on solids, we would (to read more about why table tops are not solid mahogany, please read our FAQ's). 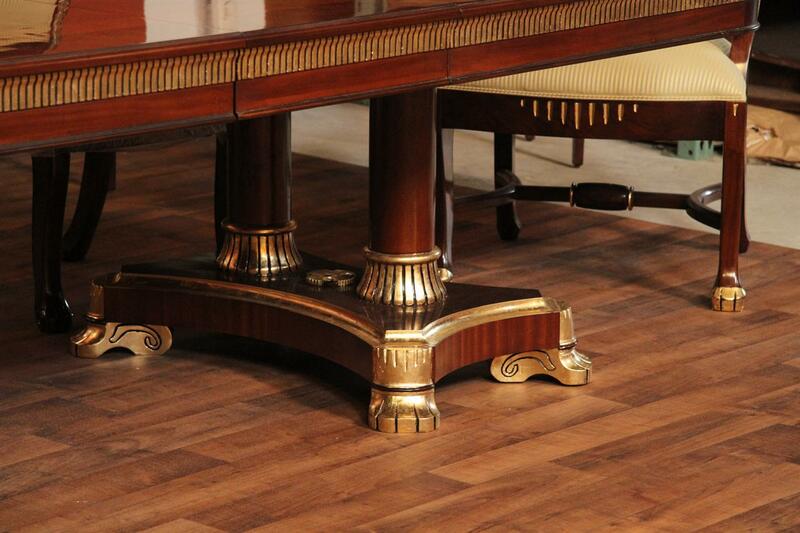 The solid mahogany columns are feathered to decrease the chances of splitting and cracking. 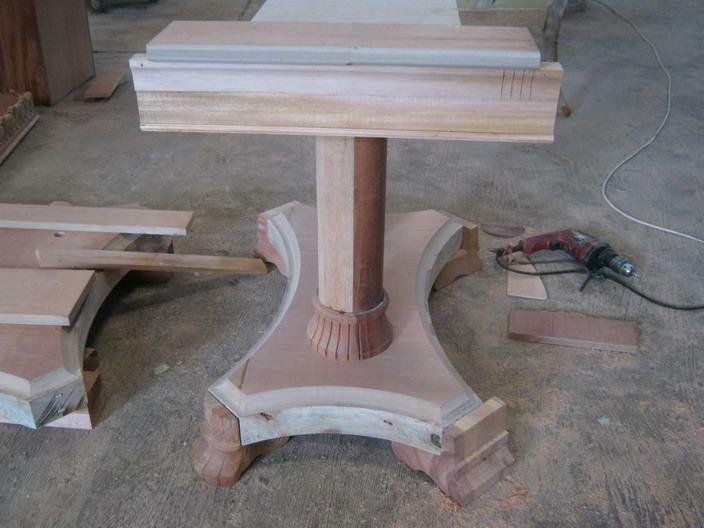 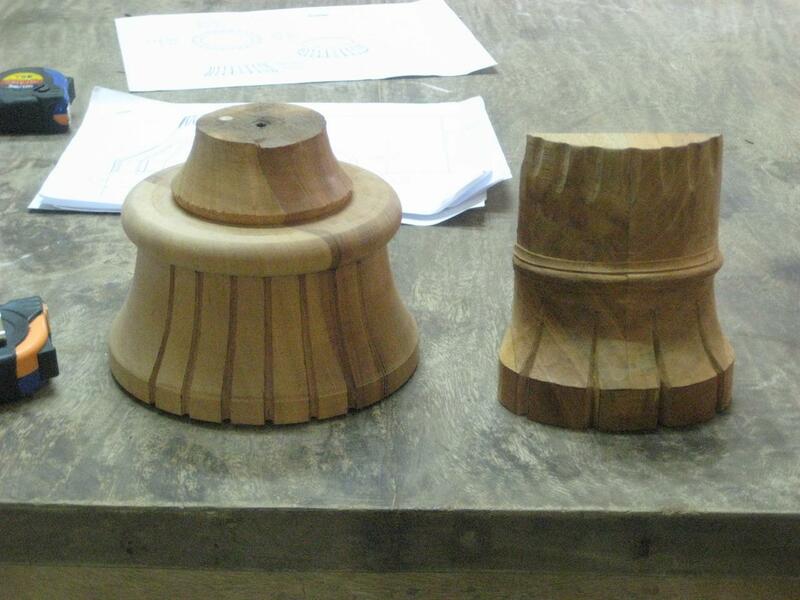 The apron, columns and feet are also solid mahogany. 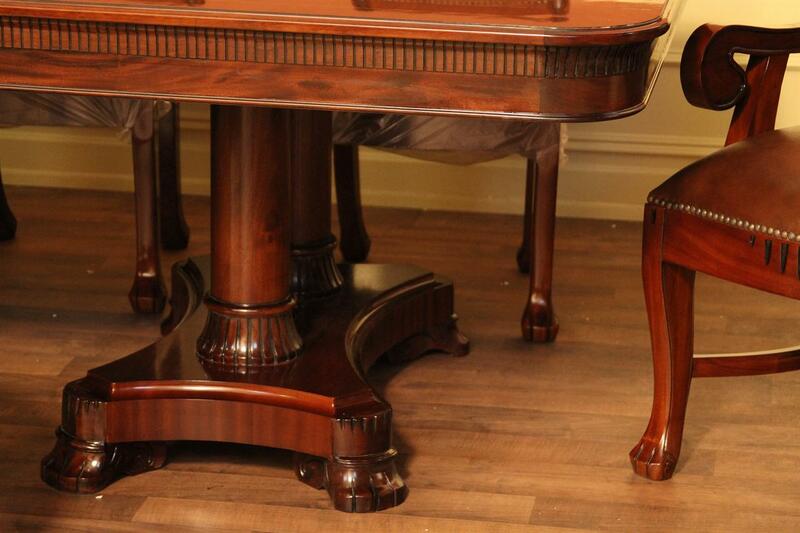 If you look carefully at some of the pictures in this ad, you will see mahogany feathering and the purpose of this table design was not only to offer our clients a great looking table, but also to bring you as much quality as we can. 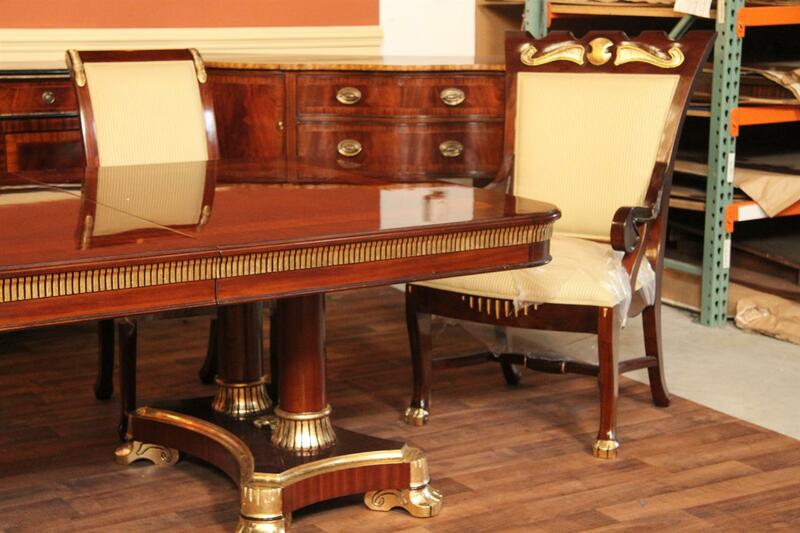 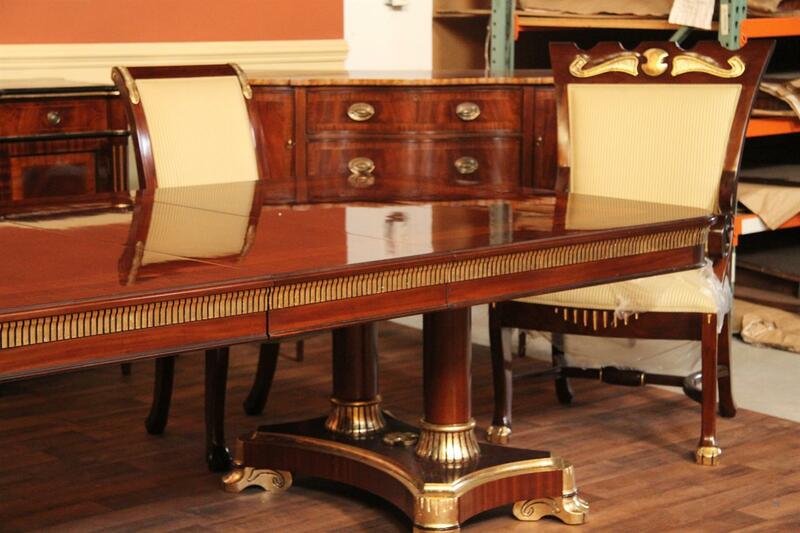 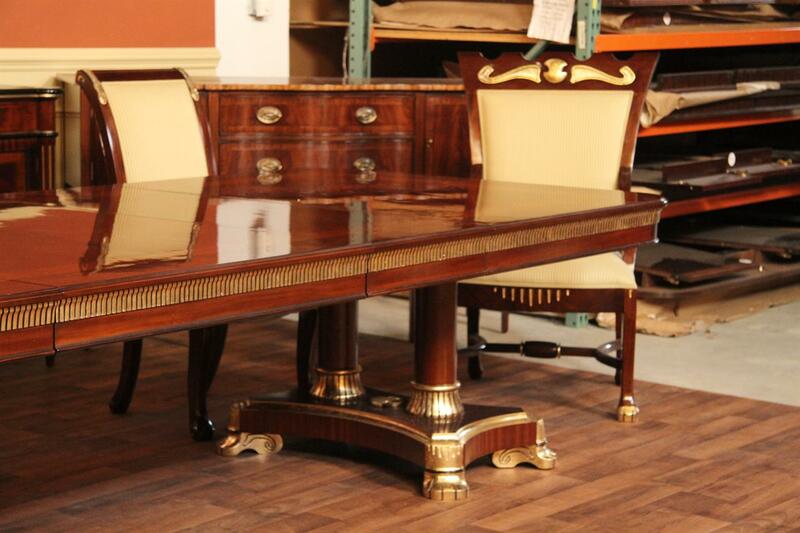 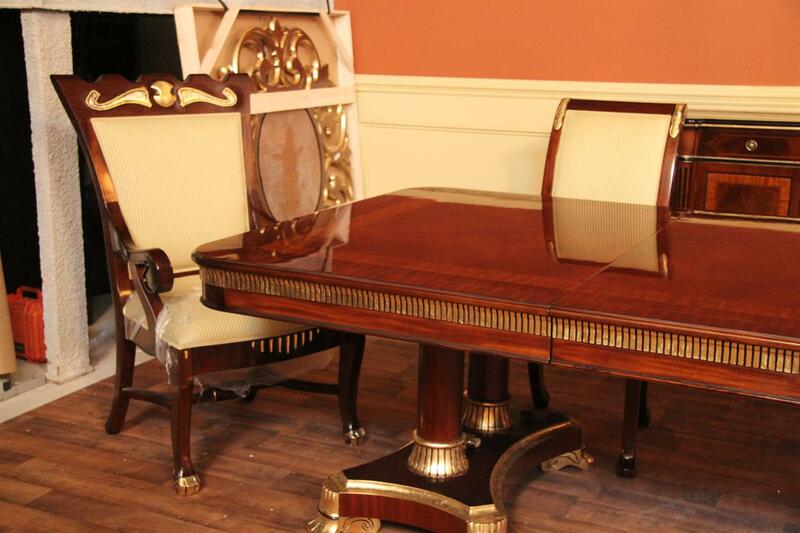 Antiquepurveyor never cuts corners with manufacturing, this is a high end dining room table fit for a king. 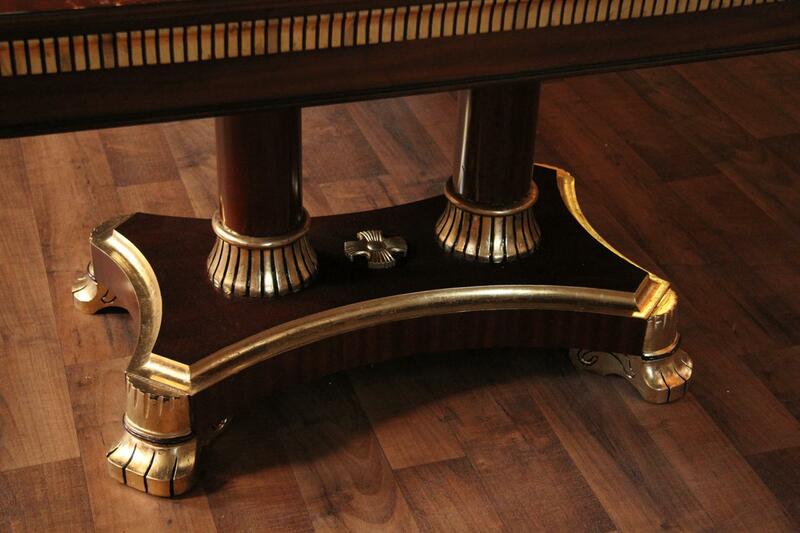 Every detail of this table was designed to make a statement in your home without being overy flamboyant. 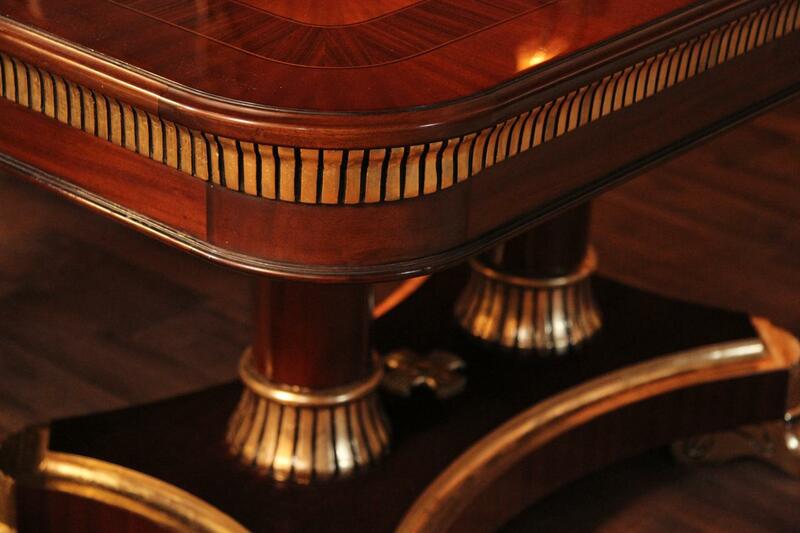 Demure is a French term for modest and this is a large modest design. 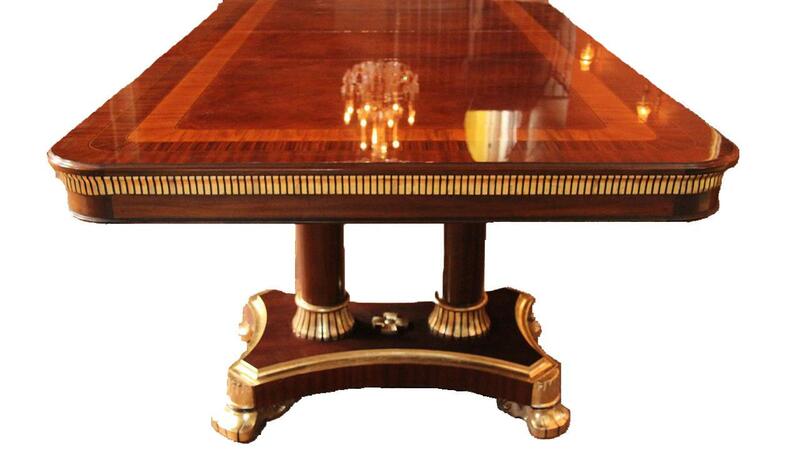 There is a modern element to this mahogany dining table even though the table has an early American paw foot regency style pedestal. 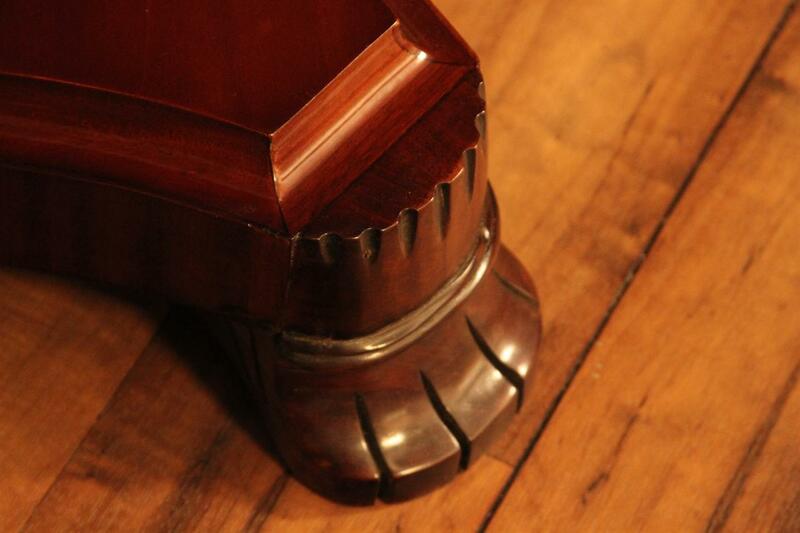 Please keep in mind, we offer a saber foot to make it look even more modern. 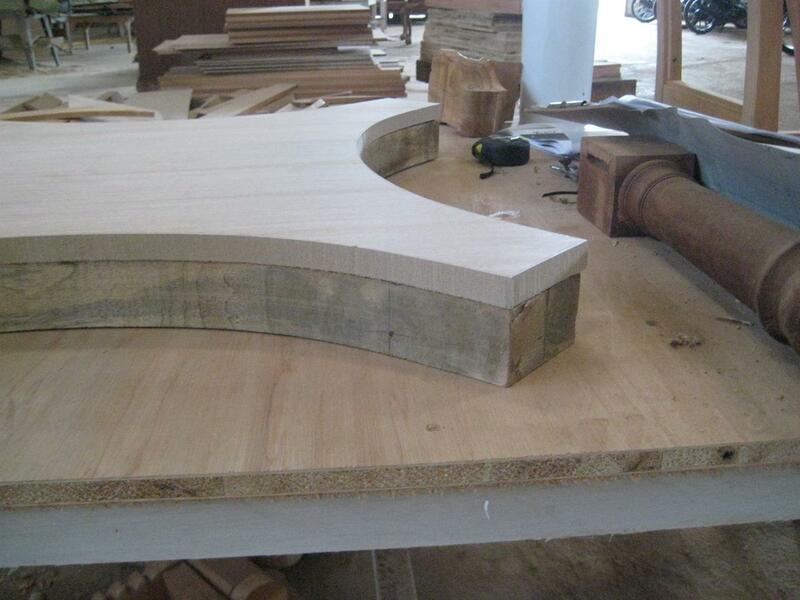 The apron which runs around the table has a routered profile to catch glaze and add character and depth to the overall appearance. 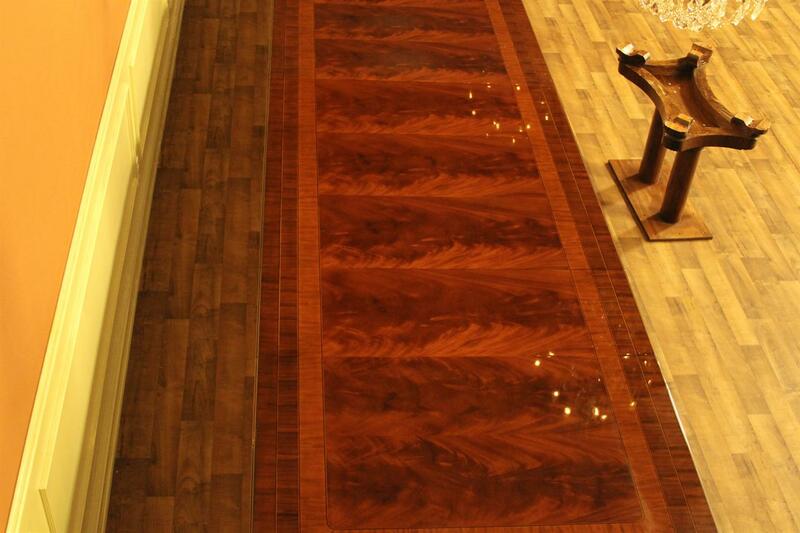 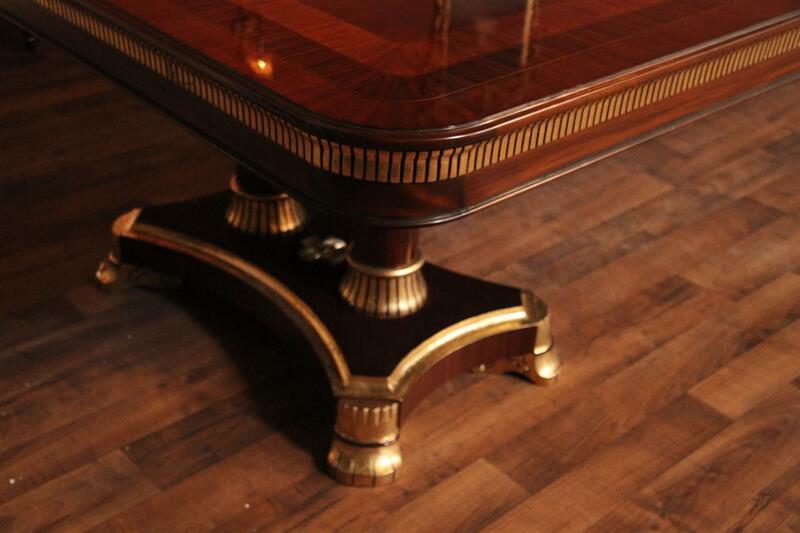 Gold leaf options are available (additional charge) on this table and we kept that in mind when designing the table. 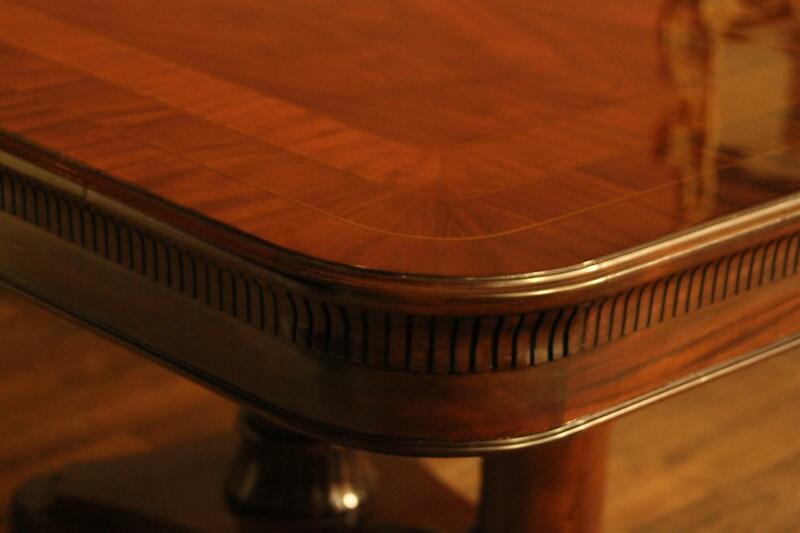 Some of the pictures of this mahogany dining table are 3D computer renderings from the design process, but most of the pictures were taken in our studio. Designer dining tables like this are usually copyrighted so you will only find it available from the source. 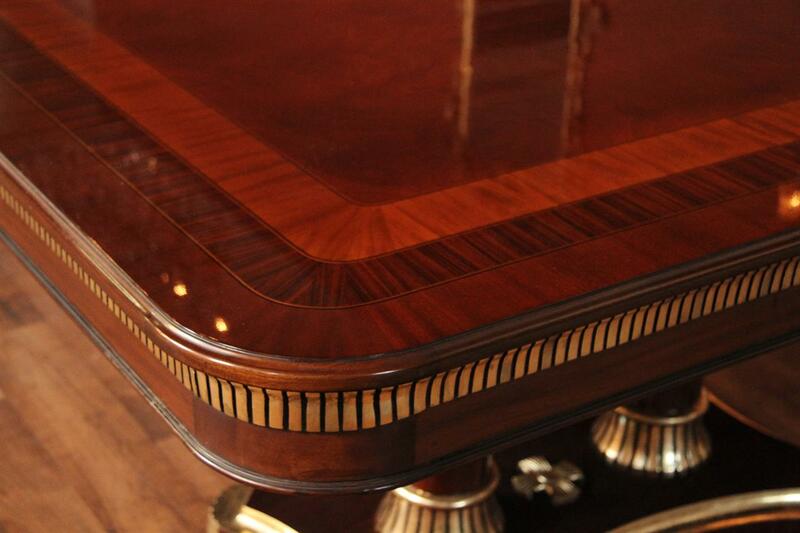 Every detail of this table is done by skilled artisens by hand, no lasers or C&C routers are used. 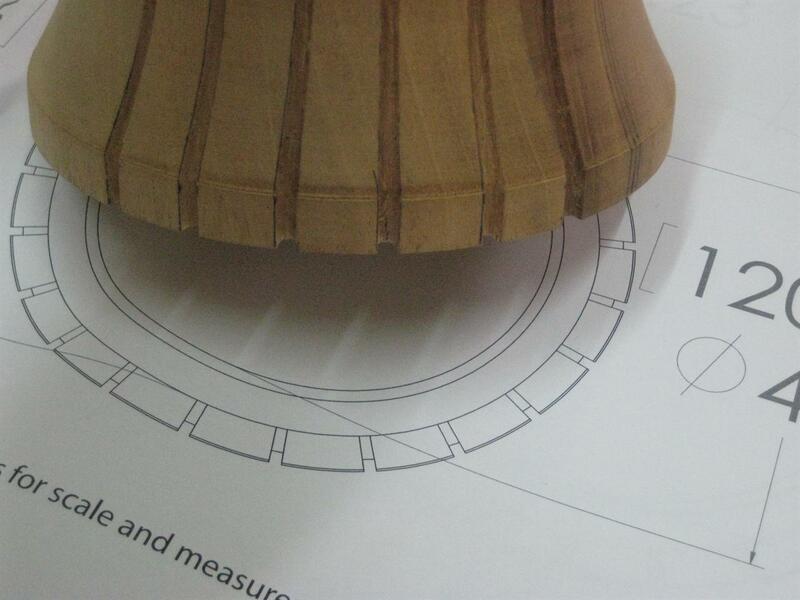 These are made one at a time. 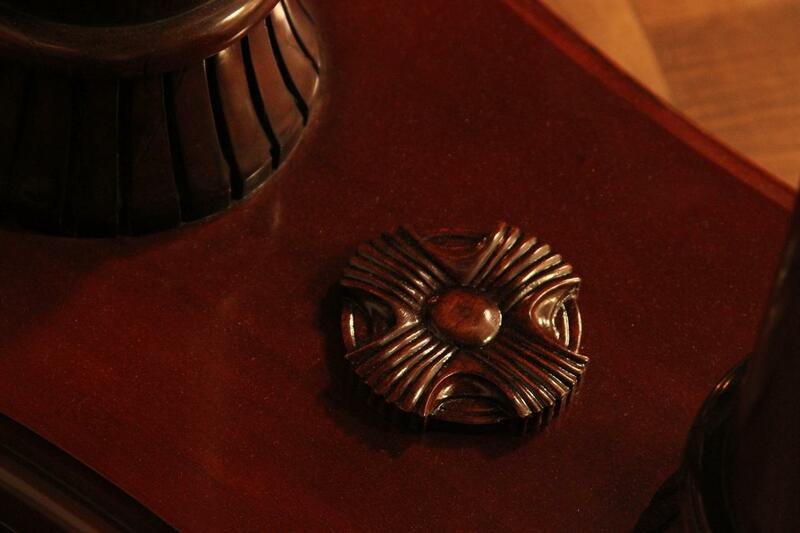 Available in a brown mahogany finish (shown above) and a red mahogany finish which is a shade redder and darker. 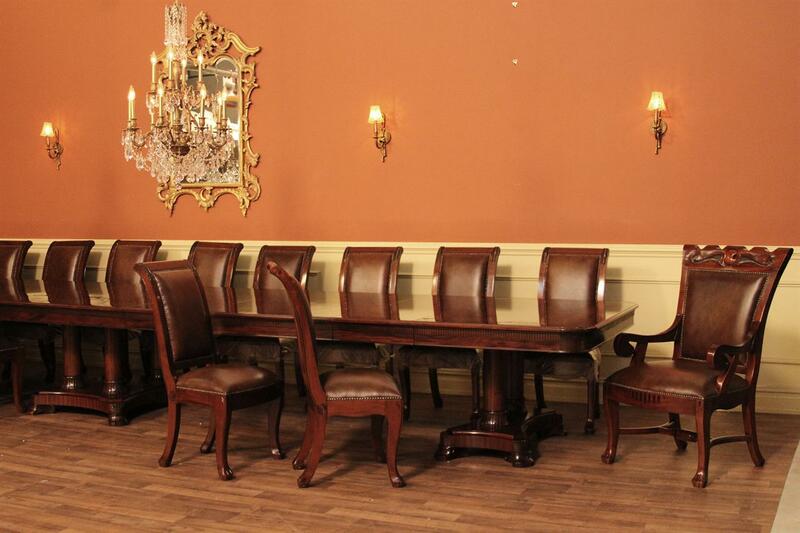 More custom dining tables and luxury dining room furniture is available online, so browse our inventory and let us help your next big purchase. 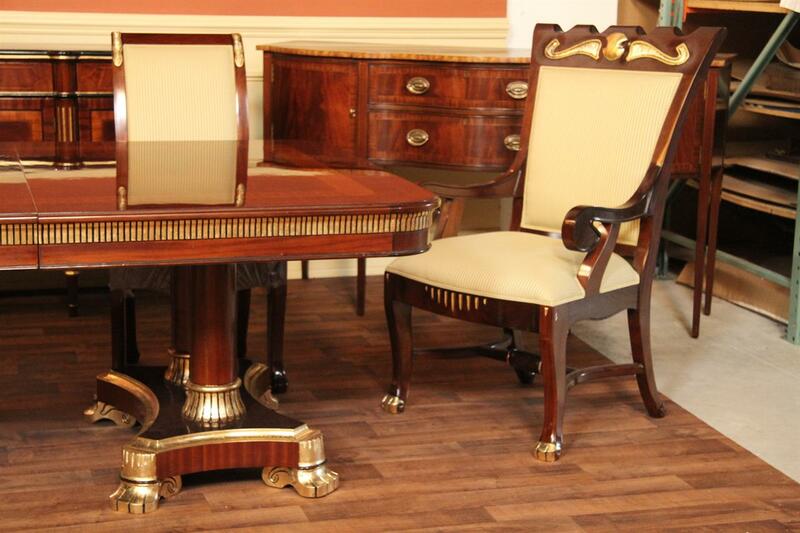 Make a mahogany dining room set with the matching King Demure chairs.